Let me preface this recipe by mentioning you may have to pick up some ingredients that you normally don't have. Unless you cook Thai or Asian cuisine often, you should anticipate a trip to the International or Asian grocery aisle or better yet, a local Asian market. Specifically, you'll need rice stick noodles, tamarind paste, fish sauce and chili sauce. For the rice stick noodles (which is great for gluten free diets), you may have a few sizes or widths available. I prefer thin noodles but it's not uncommon to see Pad Thai made with wider cut noodles. Use whatever you prefer in this recipe. For the tamarind paste, don't worry if you purchase a jar and are not sure on how to use the rest. The good thing is that it lasts quite a while in the fridge and there's a slew of recipes using tamarind paste on google. Fish sauce is one of those ingredients some people are sensitive to. The smell can be pretty pungent but trust me, it's a necessary ingredient and substitutions won't give the depth of flavor the dish needs. Lastly, the chili sauce is kind of the wild card. There's sweet and hot garlic versions. You'll find the sweet version served as a dipping sauce for Thai spring rolls and the hot garlic version is better known as Sriracha. I've used both versions and you can use either one depending on whether you want it on the sweeter or hotter side. This is my go to recipe for Pad Thai and you can also substitute the chicken for pork, shrimp or even tofu. Feel free to add other ingredients to make it a heartier dish (as this is just a good base recipe). Some ingredients you can add include shredded carrots, shredded red cabbage, or even scrambled eggs. In a large bowl, place the dry rice noodles and pour hot water over them to cover. Allow to soak until noodles are softened until al dente being careful that they do not get too soft; drain and set aside. To make the pad thai sauce, in a small bowl, combine the tamarind paste, fish sauce, chili sauce and brown sugar; set aside. In a wok or large sauté pan over medium high heat, add 1-2 tablespoons of oil. When it begins to shimmer, add the minced garlic and stir fry until fragrant. Add the chicken to the wok and stir fry until opaque, about 5-7 minutes. Add the chicken stock and Pad Thai sauce into the wok; stirring to coat the chicken. Add the noodles and using tongs, stir fry the noodles, tossing to coat in the sauce. Continue to stir fry being careful not to break the noodles. Add the bean sprouts, green onions and cilantro; toss to combine. To serve, garnish with more minced cilantro, a sprinkle of chopped nuts and wedges of lime. OOOO! One of my favorites! Thanks for inspiring me to make it! This looks sooo good! I love pad thai. I finally got my hands on a block of tamarind a while back...I think it will work a lot better than whatever the tar-looking tamarind is that is sold in jars. Ick! Nicole, let me know how the block works out if you try the recipe! This looks delicious and easy! 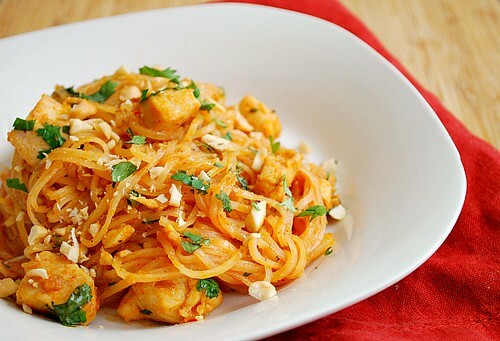 My previous attempts at pad thai have not been successful, so I will have to try this soon. Thanks, Joelen! I love a good pad thai! Gordon Ramsay's recipe is not bad as well :) yours look good too! Thanks Jesica! I'll have to try Gordon Ramsay's version, so thanks for the suggestion!